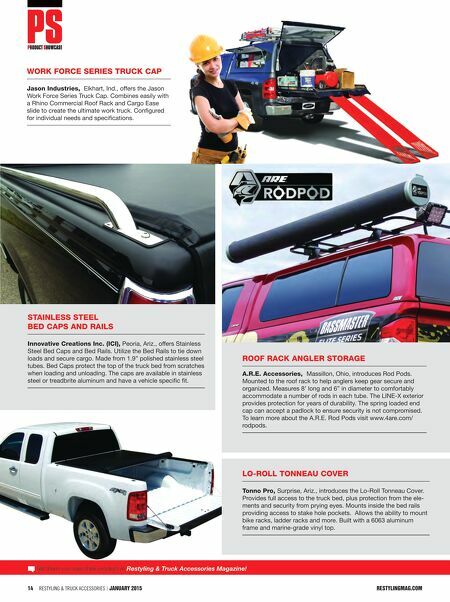 14 Restyling & tRuck AccessoRies | January 2015 restylingmag.com Tell them you saw their product in Restyling & Truck Accessories Magazine! work force series truck cap Jason industries, Elkhart, Ind., offers the Jason Work Force Series Truck Cap. 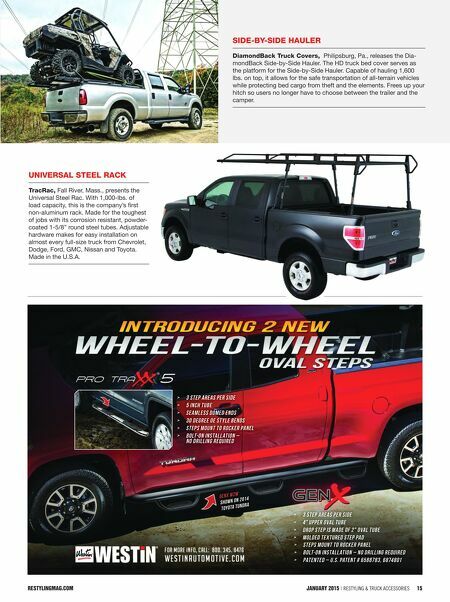 Combines easily with a Rhino Commercial Roof Rack and Cargo Ease slide to create the ultimate work truck. Configured for individual needs and specifications. Lo-roLL tonneau cover tonno pro, Surprise, Ariz., introduces the Lo-Roll Tonneau Cover. Provides full access to the truck bed, plus protection from the ele- ments and security from prying eyes. Mounts inside the bed rails providing access to stake hole pockets. Allows the ability to mount bike racks, ladder racks and more. Built with a 6063 aluminum frame and marine-grade vinyl top. roof rack angLer storage a.r.e. accessories, Massillon, Ohio, introduces Rod Pods. Mounted to the roof rack to help anglers keep gear secure and organized. Measures 8' long and 6" in diameter to comfortably accommodate a number of rods in each tube. The LINE-X exterior provides protection for years of durability. The spring loaded end cap can accept a padlock to ensure security is not compromised. To learn more about the A.R.E. Rod Pods visit www.4are.com/ rodpods. stainLess steeL bed caps and raiLs innovative creations inc. (ici), Peoria, Ariz., offers Stainless Steel Bed Caps and Bed Rails. Utilize the Bed Rails to tie down loads and secure cargo. Made from 1.9" polished stainless steel tubes. Bed Caps protect the top of the truck bed from scratches when loading and unloading. The caps are available in stainless steel or treadbrite aluminum and have a vehicle specific fit.